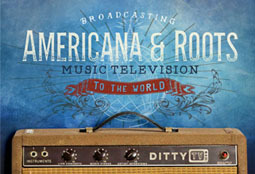 Thanks for supporting DittyTV, Americana Roots Music, and it’s Artists! As a valued industry partner with DittyTV, we are excited to provide you with an exciting promotional opportunity. While DittyTV produces a great deal of original content, we are also curating and broadcasting music videos, EPKs, full length concerts, and other music related content. We look forward to a mutually beneficial relationship and value you as a partner with DittyTV and it’s mission to foster and promote Americana Roots Music and it’s artists.